We had a great time exploring our question 'What products are Fairtrade?' and learning more about Fairtrade and the Fairtrade Foundation. The fortnight was packed with great learning; our video can be seen at top of the page. Over the fortnight we learnt about where food is grown, how it gets to us and what products are Fairtrade. Our learning was further enhanced by visitors from 'The Body Shop' and the 'Good Taste Fairtrade Shop', helping us to understand further what products can be Fairtrade and what the Foundation does. WOW! What a super health week we had in foundation! Our days started with 'Just Dance' to get ourselves up and moving. This was great fun and we certainly had lots of energy! This is a very exciting topic! We love learning about the people who help us and is it always great to have visitors in to give us more information. We would like to say a big thank you to those grown ups that came in to tell us all about how they help people. This is always such a valuable experience for the children and so enjoyable! We came into class one morning to find that a crime had been committed! OH NO! The police were very impressed with our detective work and the criminal was captured very quickly. Ask you child about their detective work and who committed the crime . . .
Over a week children worked incredibly hard to write a letter that thanked their grown ups for the help they give them. We looked at different letters and identified the key features. We then thought about and decided on the thing we were most thankful for. Some of the ideas children has were just fabulous! The tricky task was writing a letter independently. All of the children tried very hard and we all hope that you received your letter in the post! We think they did a wonderful job of using all of their literacy learning to produce such a great writing! We have had an 'Egg-cellent' time caring for our chicks! Our time with our chicks has been a wonderful experience. Over the incubation period we viewed a chick calendar which showed us exactly what was happening inside the egg. We read about how the chicks were developing and looked at pictures showing us what was inside. Fascinating stuff! As the chicks hatched we made sure our brooder was all ready for them. The children helped to get the heater ready and fill up the food and water pots. We worked together to care for the chicks; making sure they have enough food, water, heat and a clean cage. We also felt it was important to show them lots of love and care so they were happy! As the chicks got bigger the most exciting thing was seeing them run, chase and try to fly around the classroom. Cleaning out time was very fun and very challenging. The chicks kept trying to escape! When the chicks came out to play it was a good job we made a tight circle as they wanted to run around the room. Mrs Needham was wonderful at being on 'poo patrol' too, keeping our carpet clean! The engagement in learning that children have shown over this time is amazing. Many children have engaged in extra writing opportunities, shown care & consideration towards the chicks, used great language, worked in groups, had great conversations about the chicks, learnt about the life cycle and much much more! Although it is sad that they had to leave we understood that they need more space and freedom as they grow even bigger. Here are some of the pictures from our time with the chicks. What a wonderful learning opportunity! Our topic for this spring half term is 'Growing'. This topic is super exciting and we have had some very special visitors! Debs from 'Eggucation' (http://www.eggucation.co.uk/) visited us with her three pet hens, 'Cindy Pom-Pom', 'Repecca' and 'Inky'. We got the chance to pet them and feed them which was fun. We also found out more about how to look after our chicks. We came up with lots of questions to ask Debs such as "How does the chick breath inside the egg?" and "How does the egg crack?" We even got a special treat because 'Cindy Pom-Pom' laid an egg for us whilst she was at school! We found out about which animals hatch from eggs and some of the information really surprised us! Did you know sharks come from eggs!? Debs left us with an incubator full of eggs to take care of until they hatch in 21 days! We cant wait! Our 'Space' topic came to a fantastic end with our 'Alien Party Day'! We were very busy on the days leading up to it planning our party, writing lists, invitations and making decorations! We decided we wanted Space themed food and decorated 'Alien Gingerbread men', made 'Alien Eyeball buns' and 'Mars Pizzas'! We used this experience to learn all about recipes and wrote lists of ingredients and instructions to create a class book based on our alien recipes. The children (and parents) worked really hard to create alien costumes for their home learning activity this term and the costumes were excellent! It was an incredibly fun and exciting day! Check out our wonderful alien outfits! Which one is your favourite? We were very luck to have the chance to join in the 'Electro City Workshop'! We had never seen so much Lego in our entire lives! We each got to construct a Lego building and then investigated circuits to light up each of our buildings with a light bulb and a switch. It complimented our topic well and the discussions we have had about light and dark! The poor alien called Beegu crash landed on Earth. All alone, she tried to find friends but no-one would talk to her. She eventually came across some 'Little Earth Creatures' (children) who were kind and friendly. They made her happy. Sadly, the 'Big Earth Creatures' (adults) were not as kind. At the end of the book Beegu finally becomes reunited with her family and she tells them all about the creatures who were kind to her. We discussed feelings a lot throughout this book and how the actions of others had made Beegu feel. We also linked this to ourselves and thought about how we would react. To follow on from this we explored the story of 'The Good Samaritan'. We read the story, talked about what happened and made links to our value of compassion. We also made links to Beegu and our own feelings about being hurt. We acted out the story and practised what we would say if we were the different people in the story. To support with our 'Space' topic we had the opportunity to visit the 'Space Dome' in the hall. It was an amazing experience to see all the stars and zoom in closer to experience them in greater detail. We also learnt facts about the sun, moon and planets. What a fascinating way to start the topic! We hope you enjoyed the children's performance of the 'The Angel Express'. They have worked incredibly hard over the autumn half term to practise songs, dances and lines. The children showed a lot of confidence and bravery to perform dress rehearsals to both key stage 1 and 2. They also performed twice for family members. We have had a lot of fun during the rehearsals and I am sure you will all agree that everyone did a super job! A huge thank you to those family members who came to watch, Mrs Burgin for giving a gold star performance with the music and to the Mosborough Primary Group for buying and making us some more wonderful costumes. Here are a few photographs of the cast; we hope you all received your individual copy of your child along with a photograph of the whole cast. Both foundation classes went on a visit to St Mark's Church. Thank you to those parents who joined us on this visit. We think it was such a great experience for the children and it was clear that they all enjoyed it. During our visit we made learnt about the meaning of a Christingle and helped to make one to bring back to school. We listened to the nativity story; it was great to hear the children recalling key parts and linking it to their learning at school. We also acted it out, saw the decorated trees around the church and sang a song about the advent candles. As part of our traditional tales topic we have learnt the story of 'The Gingerbread Man'. We read the story, described the characters, wrote speech bubbles and sequenced the story. We decided we wanted to bake our own gingerbread men. To do this we made lists of ingredients and equipment. Miss Tibbs kindly took our lists to the supermarket and bought all of the things we needed. We then created the recipe using the language first, then, next, after that and finally. We practised acting out the instructions and then we were ready to go! Mrs Needham helped and we made the most delicious gingerbread men! Children in Need 2016 was an incredibly fun, exciting, busy and spotty day! Thank you to all of those children and parents that supported the day by wearing spotty clothes, donating cakes/buns, buying raffle tickets and donating money. We had such a wonderful day and raised lots of money. 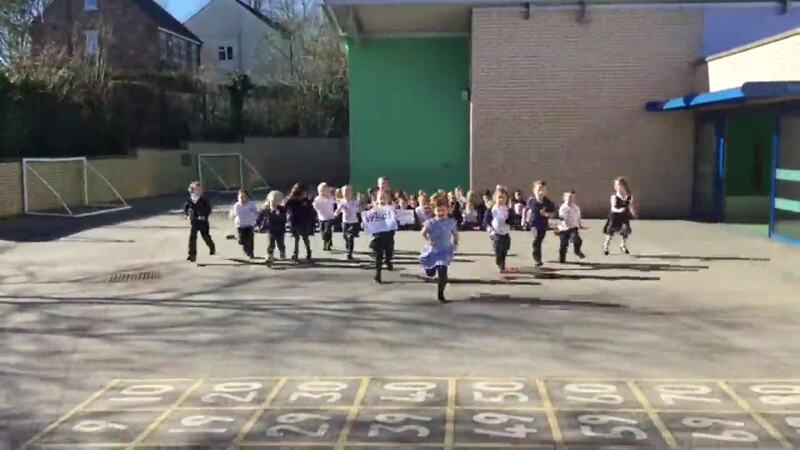 During the school day each year group had planned and set up an activity for the rest of the school to take part in. Throughout the day we travelled around each classroom to enjoy the activities! The day was super fun and competitive! The children enjoyed games like snap, building, relay races, map reading, team games and guessing games. This week we have done our first P4C session as part of anti-bullying week. The children started by exploring what they thought P4C was and what we would do in the session. Once we knew it was about thinking, having ideas, listening to others, sharing our ideas and asking questions we were ready to begin. We started with a song and got into a circle ready for the session. For our P4C session we focussed on the story 'Something Else'. It was all about a creature that tried very hard to join in but others were not kind to him as he was 'something else'. When another creature wanted to be his friend he initially wasn't very kind but then he saw that this was not the right thing to do. They became friends and although they were different it was just fine! Throughout the story we paused to discuss what was happening and the children were very thoughtful about the storyline and the feelings it provoked in the characters and themselves. We came up with some questions for the animals in the story such as 'Why were you unkind?' 'What could you do to make it better?' 'How could you be kind next time'. After the session the children thought about what made them special and drew pictures of themselves. They also used pictures of themselves and friends to talk about why they may be the same but importantly why they are different. Children discovered that they had many things in common but also that they each had may differences such as what they look like, what they were wearing, the things they enjoy and the things that make them happy. What a lovely session! He talked to us about being confident and believing in ourselves. We enjoyed the session and all came away feeling ready to try our best and believe in our own abilities. Oh dear! What could this be? Our learning journey has again taken us on a hunt around the school and in our outdoor environment. We came into the classroom one morning to find something very interesting and a little bit scary at the same time. What could it be? As the morning went on so many questions were going unanswered. What is it? How did it get in? Why has this happened? Do we need to worry? We decided that a hunt for clues was the best plan of action. So, we all got our coats on and began our hunt. During the hunt we found a number of clues. These included, fur, scratches, footprints, a den and even a big poo. It was all very exciting and we finally came to the decision that it was in fact a bear that had decided to come into our classroom. The next day was even more exciting because Mr Fallon had managed to capture the bear on camera doing a number of fun things. We could see it hanging on a branch trying to get to the roof, looking through the windows of Mr Fallon's office and also playing on the grass with flowers. We decided it was a friendly, funny and cheeky bear! Over the week we have done lots of literacy work about the bear such as, asking & answering questions, descriptions starting with 'It has', sequencing our hunt and also trying to figure out what kind of bear it is by watching factual video clips. Keep your eyes open and your ears listening at all times! Please tell us if you see the bear! We have had a wonderful week learning all about harvest. We know that it is all about saying thank you for all of the crops and food that has grown, it is now ready to harvest! All of the children worked incredibly hard to plan and make our delicious 'Harvest Hotties' and chocolate spoons. Over the week we focussed on following instructions and our counting skills to make sure we were ready in time for the harvest farmers market. Thank you to all those parents that came to support our farmers market. We are very proud of the children and the great products they made. What a lovely afternoon to finish a great first half term! This half term we have done lots of learning about 2D shapes. We have been learning their names and using great mathematical language to describe them, such as corners and sides. We went on an exciting shape hunt around the school. Thank you to everyone who helped their child to go on shape hunts at home too. After ready the story 'We're Going on a Bear Hunt' we decided we really wanted to go hunting for dinosaurs around our school. We thought carefully about what we would need to take with us and we shared our ideas with our learning partners. Once we had decided what to take on our hunt we drew pictures and labelled the items to make sure we did not forget anything! Luckily we found a map! As we got more and more excited we made sure we were fully equipped for the hunt. Children made their own maps, telescopes and magnifying glasses to take on the journey. We set off all together and found some important clues along the way. We went 'over' the climbing frame, 'around' the bird hut, 'through' the grass and 'under' the branches. We found some dinosaur poo 'in front' of a tree and had to look careful 'into' the den. We found 2 eggs! As we made our way back to the classroom with the eggs we continued to use our positional language to follow the map accurately. When we finally arrived safely back to our classrooms we talked about our hunt. What was inside the egg? Where had it come from? Is it Trudy's? How can we look after it? What happens when it cracks open? The children made a decision about what they thought was inside and recorded it into their literacy books. We used our phonics skills to label our ideas. Here are some photographs of our hunt. We also have some displayed on the wall outside the classroom. The dinosaurs have been to visit! It has been a very exciting half term with lots of dinosaur fun taking place! We got a very exciting message from Trudy Tyrannosaurus. She asked us to help her and said we needed to show great counting skills. We found her picnic basket in the classroom and were able to count the items inside accurately. We needed to remember to point to each item and say the number name. She was very impressed with us. Sadly, the next day Trudy had some terrible news for us :-( Terry the Tyrannosaurus stole lots of her picnic food and had made her sad. Luckily we found his bag of goodies and used our great counting skills to check how many items he had stolen. There were lots of different objects to count and the amounts started to get bigger and bigger. We had to change our strategy and move the objects into a line to make sure we did not count any twice. WOW! We did such a great job and Trudy was impressed once again. Another day passed and poor Trudy was in trouble again! Queen Elsa lost control of her powers and froze Trudy's bones that she gives to her dog. She needed our help again. This time we found it tricky to count objects that we could not move into a line so we worked out a new strategy. We used a pen to mark off the objects once we had counted them. After all of that hard counting work Trudy was happy again! We read the story 'Giraffes Can't Dance' together as a class. The children really enjoyed hearing all about Gerald the giraffe. Gerald found it very easy to munch shoots from the trees because he was so tall but found it very tricky to dance. The other animals were not very kind to Gerald and he was a little sad. Gerald decided he wasn't going to give up! He found his 'own music' to dance to and was able to show the other animals just how great he could be. He never gave up and was very, very happy! We have put these targets in the children's literacy books for you to see. They are also on display on the classroom window. We hope you enjoy reading them! We are wonderful in willow class . . .
As the new year is now getting into full swing we have been having even more fun! We have spent the first three weeks getting to know one another and our exciting new classroom. We have explored all of the new activities both indoors and outdoors. The photograph below shows our behaviour charter. We worked as a class to decide on what we thought were 'good choices'. We were very good at choosing the actions that we thought would make our classroom a happy and safe place to learn. All of our hand prints represent our promise to follow these rules during our time in willow class.